Rubber Room Ramblings: YOU GOTTA LOVE ICE CREAM! YOU GOTTA LOVE ICE CREAM! 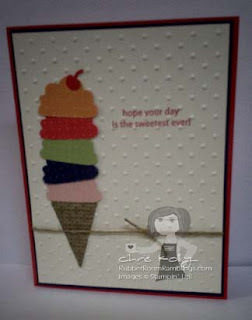 To make this fun little card I used the Build a Cupcake Punch, item #121807 for $16.95 available in the Occasions Mini Catalog. I used the top of the cupcake to make the ice cream scoops! This punch is definitely a "must have". It is so easy to use, and who doesn't love ice cream and/or cupcakes? Stop back by tomorrow and see a cupcake card made with this punch. I love this card, Chris! Your blog always makes me smile so...I'm passing along the Stylish Blogger Award! MY WATCH IT WEDNESDAY VIDEO BOXES! 3 x 3 CARD BOX HOLDER AND MORE! MORE FLOWERS FROM "THAT MICHELLE"! Two Tags Die Box Tutorial Video!